I’m the first to admit it. 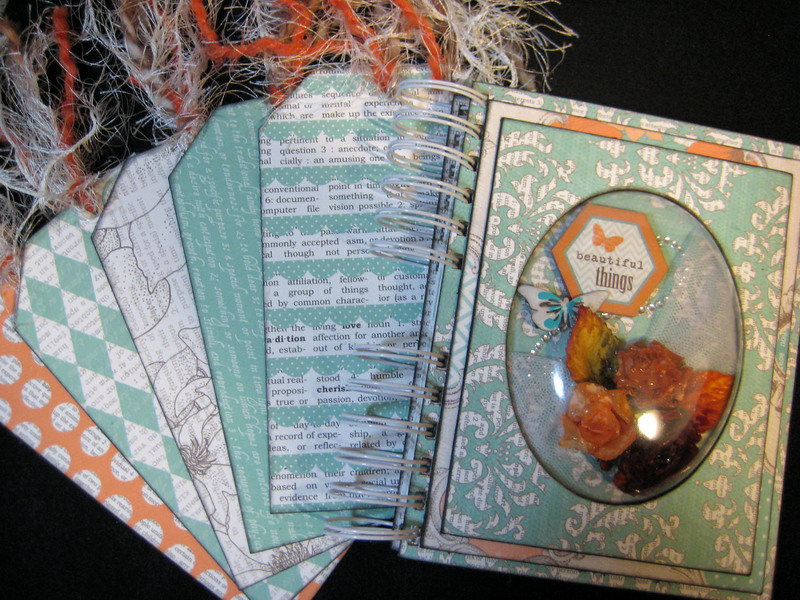 When I started making mini books several years ago my scrapbooking just went right out the window! I love scrapbooking but there’s something about making a mini book that gives me great satisfaction in knowing the project is complete and I’ve got the perfect little gift for someone. The Xyron Design Team is hopping this week with Teresa Collins so be sure to check out the Xyron and Teresa Collins Design Team blogs for loads of ideas! 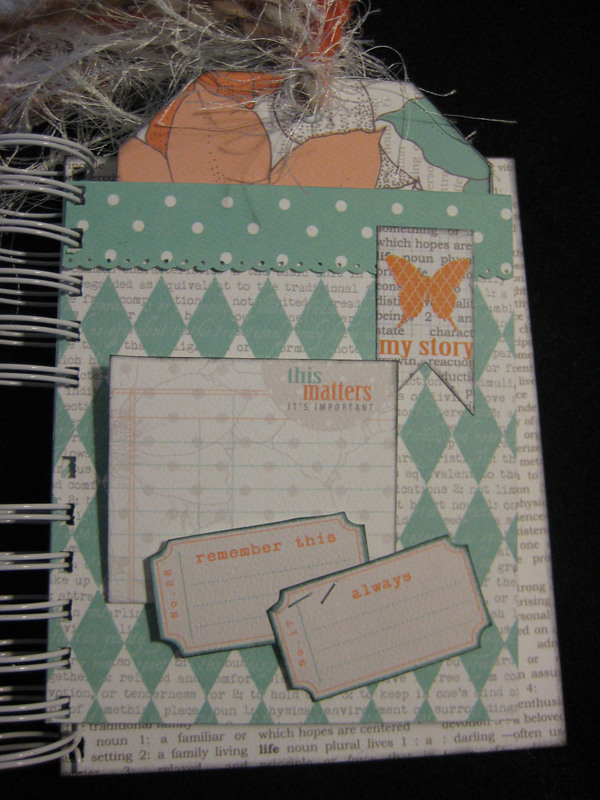 Here’s my newest little mini book made from “Tell Your Story,” a new paper collection from Teresa Collins. I’ve always enjoyed working with Teresa Collins paper collections; I taught several of her kits at Scrap Tales during my tenure there. And, once again I used some of those 527 envelopes I got for free a few years ago. The envelopes make great pockets and they’re easy to cover with beautiful papers. For the inside pages the envelope ends are snipped off to fit inside the bubble frame’s dimensions. Then they are measured and “Tell Your Story” papers cut to fit just inside the envelope edges. 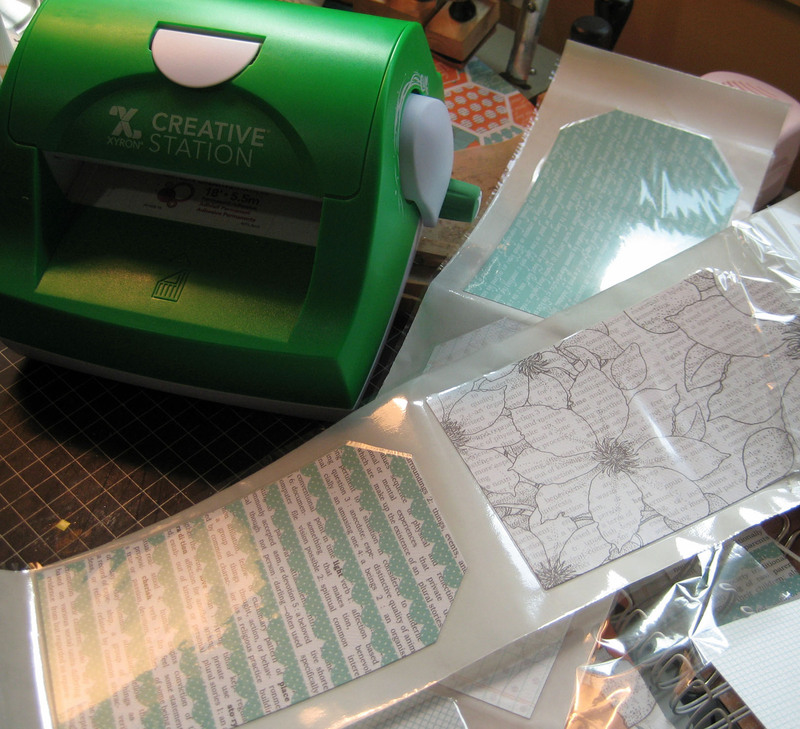 I ran them all through my Xyron 5″ Creative Station and adhered them to the envelopes. I wanted to fancy them up a bit so cut scrap the width of the envelope pages and punched with a couple of my favorite EK Success Edgers: Dotted Scallop Edger Punch and Scalloped Scallop Edger Punch. The scraps are trimmed to about 3 inches deep and scored so about 1 inch of the punched edge hangs over the envelope pocket and the rest is tucked inside and adhered. 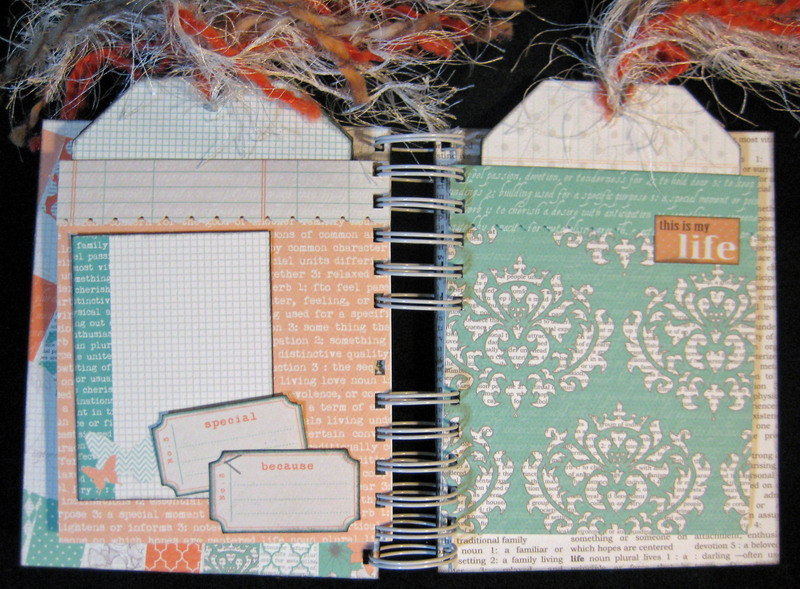 The pages are decorated with journal tickets and journal blocks – all from the Teresa Collins “Tell Your Story” collection. It’s just loaded with ideas for recording your memories. I adhered just the corners of the tickets so the journal cards could be tucked in and easily accessible. 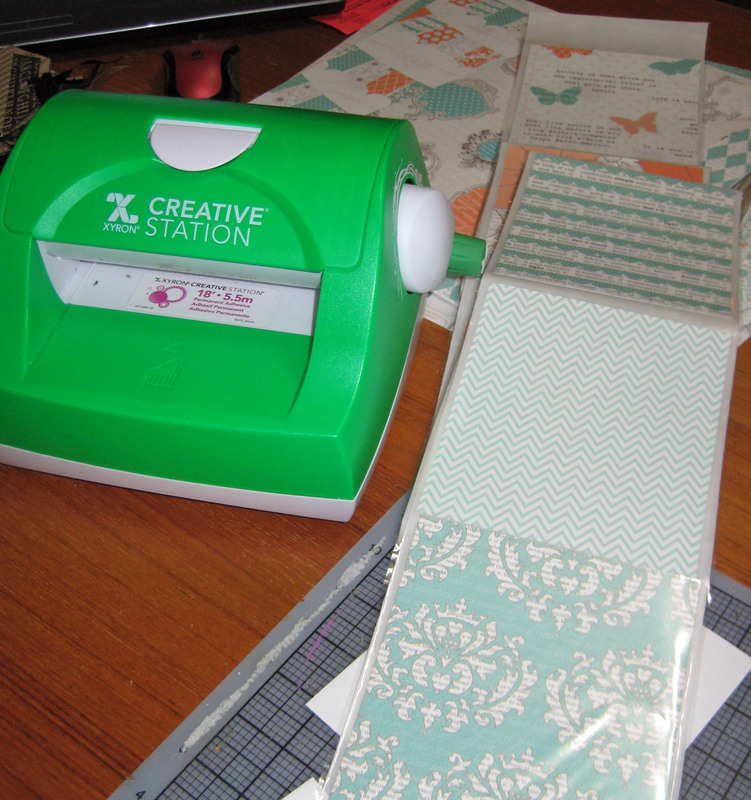 The book is bound with my Zutter Bind-it-All – my favorite binding machine! And, I used white coils to coordinate with the papers. The pockets in this book open at the top and I created a tag for each one by cutting more of the “Tell Your Story” papers to fit inside the pockets comfortably. They were also run through the Xyron 5″ Creative Station and adhered face-to-face. I trimmed the corners to give them a tag shape and edged each with Black Soot Distress Ink. A white 3/16″ eyelet in inserted at the top of each tag so I could include some beautiful fibers. I love fibers and use them a lot so I buy fancy yarns and cut my own. They give the project a nice, rich feel in my opinion. My favorite part is the bubble decorations. I inked three paper flowers and dipped them in UTEE and heat set to give them a porcelain appearance and glued them to the top of knotted piece of white tulle. Three stickers from the “Tell Your Story” collection are popped up with dimensional foam adhesive and layered to create depth and shadows. There’s a little Piccolo butterfly by Globecraft Memories that is painted with the company’s new Cool Set Enamels in Titanium White and Cobalt Turquoise. It’s also popped up on about four layers of dimensional foam squares. I felt it needed a bit more so pulled out a flourish from Want2Scrap – gotta love these! It really turned out to a cute little project. I may still add some fibers to the rings – or not – and I feel the cover needs a tad more embellishing, but that’s another day. What a great album for just about any occasion! this is gorgeous Linda, great job! I know just what you mean, Linda, and this mini is fantastic! Love how you moved those colors throughout the book onto each tag. Thanks Marjie! I love the colors in this particular line of papers and stickers. Playing around with some books today. Just need to work through how I want to finish them. Scrap your Stash class. I love the opportunity to work with beautiful, precious photos that tell a story. Scrap your Stash Marathon. I've swiped a few photos from my son's Instagram page. They're just beautiful and I had to use them! Scrap your Stash. It's easy when I have such beautiful photos to scrap. Photo credit: River Neff at Mezzaluna Farmstead.